"Survive, recover, live -- that's the motto of retired Marine Corps Sgt. Rob Jones. 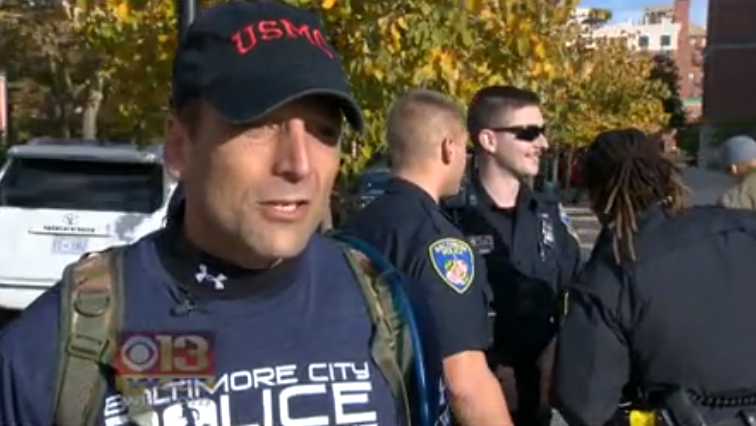 Jones is inspiring others with a 31-day marathon challenge that had him running around Baltimore during Friday morning's Veterans Day Parade. His mission is to run 31 marathons in 31 cities for 31 straight days. "Yeah, I feel pretty good. That was so cool," Jones said. He logged 812 miles in only one month. "He's been working towards this and training every single day for 18 months towards this goal," his wife Pam Jones said. Rob Jones, who is from Virginia, pounded the pavement with prosthetic legs." “I think what I’m doing here applies to everybody, but obviously I’m a part of the wounded veteran community,” Jones said. “That’s my main focus but the lesson applies universally. Jones’ lesson: to persevere in difficult times resonated with the city police department, which honored him with a plaque. Dozens of volunteers in the department accompanied Jones during his run after Lt. Christo O’Ree heard Jones on a podcast about leadership. "Jones’ 31 marathons in 31 days has consisted of 26.2 mile runs in each city in the mornings before moving on to the next day’s challenge. On the observed federal holiday of Veteran’s Day on Friday, Jones 30th run is taking place at Camden Yards in Baltimore which is especially poignant. He’s a huge Oriole’s fan. Friday also marks the 242nd birthday of the Marine Corps. Jones’ 31st and final run on the National Mall Saturday will consist of multiple loops beginning at the Lincoln Memorial passing each of the war memorials. Jones plans to run four loops of roughly 1 and 1/2 hour blocks of time separated by 20 minute intervals of rest." "Jones said his runs have been going really well and has seen improvement. "I've been getting a littler faster with my runs," he said in October. "I'm getting more in shape." However, running such long distances does not come without challenges. "It's tough to get out of bed every morning and do the exact same thing," he said. Jones headed home to finish his mission. On Friday, he ran in Baltimore, and on Saturday, Jones ran at the National Mall and invited the public to join him for his 812th mile.